The best selection of new & second hand, speed boats and sports power boat for sale in the Philippines, including bay boat, RIB and aluminum. The Puerto Galera Classified Ads pages give you best speed boats for sale listing in the Philippines and Asia. We can help you find water sports boats and power boats for day trips, game fishing, wakeboarding and water skiing. All the speed boats for sale here are designed to use outboard motors. If you are looking for just an outboard engine for a speed boat or perhaps you were thinking of a jet ski, then please review the following page for our selection of outboard motors & jet skis. A fast motorized boat or launch typically with one or more outboard engines. Looking for something larger, select one from the Luxury Power Boats Motor Yachts page. Choose your best boat here or email the webmaster(at)pgyc(dot)org if you seek something else. Go-anywhere 15-foot Seafarer speedboat and suited for island hopping, sport fishing and weekend travel. Powered by a 90HP Yamaha 2-Stroke with 15HP trolling / backup motor. Includes Bimini / full boat cover, sound system, sleeps two. Galvanised single axle trailer. 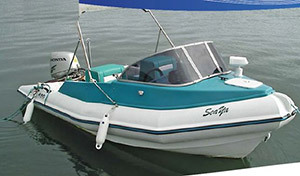 Cruise Craft 15-foot Australian designed / built fibreglass speedboat powered by a Johnson 70HP 2-stroke outboard motor; two swivel/fold moulded seats; forward cuddy cabin. Ideal for sport fishing or beach hopping. Galvanized trailer included. Ally Craft Apache 435, 12-foot Australian designed / built aluminium speedboat powered by a Yamaha 50HP outboard motor; Bimini top and two moulded seats. Ideal for sport fishing or beach hopping. Supplied with galvanized steel trailer. Almost new (2016) Trevally speedboat for sale. Powered by: 140 Hp Suzuki Lean Burn EFI 4stroke Outboard - only 180hrs. 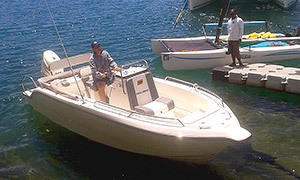 Excellent for fishing, cruising and island hopping. Fits 7-pax. Deep-V hull excellent in rough waves. Very clean and meticulously maintained. Offered with: Garmin Echomap 50s GPS/Fishfinder, Icom Marine VHF Radio and Infinity Bluetooth Radio and Marine Speakers. Complete with Bimini top and trailer. Famous Maxum 1800 MX bowrider sport boat for sale in Subic Bay. Powered by a 3.0 engine (approx. 18 liters per hour cruising 23 knots), 30 hours, with bimini top, fiberglass flooring with carpet. Boat trailer. If you have a sports boat or speed boat for sale, please email: item description, an image file (640 x 480 pixels or larger) and your contact details to webmaster(at)pgyc(dot)org, or use the contact the club form. Note: there is a modest, one-time listing fee (US$75 for boats valued above US$25,000, else US$50) for posting your advertisement. To advertise your enterprise, we have other ways to reach our Members and friends. Email to webmaster(at)pgyc(dot)org today for advertising options.